Jambalaya is one of those dishes that smells amazing and the warm spices just seem perfect for a cold rainy or winter day. It’s got the famous Emeril (BAM!) trinity of onions, peppers, and celery plus some creole seasonings in the mix. Usually it’s loaded with as many calories as it is flavor, so I was looking for a way to keep the calories down without losing the taste. I think this version turned out pretty well and it only takes about 15 minutes to throw together. The trick is to use pre-cooked rice so that you don’t waste time waiting for the rice to be ready. Jambalaya is very forgiving on amounts so don’t get stuck on the idea of what’s a large onion or a medium pepper. This dish can be light or heavy on the veggies just based on your family’s personal preference. If you love the taste of celery, use more. If you hate green peppers, use red, orange, or yellow for a sweeter taste. 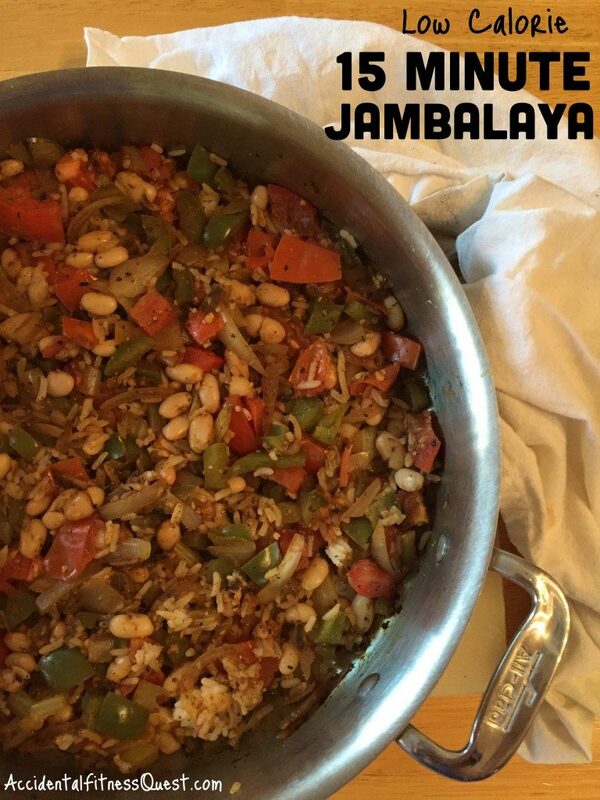 True jambalaya is made with andouille sausage which also adds to the calorie content. I have a tip for you that I follow with all of my recipes. Everyone has different tastes so many times I purposely don’t mention a specific meat or protein to use in my recipes. Use what you have ready in your fridge so that you don’t buy or cook something special for a recipe. Make it your own. Some great ideas are browned ground beef or turkey, spicy turkey sausages, shredded grilled chicken breast, or even vegan chorizo. Dice the veggies to get them ready. You don’t have to be exact with the size, but just aim for a small size that you like. Heat a large pan over medium heat and spray with non-stick spray. Add the onion, bell pepper, celery and garlic and cook the until the veggies soften nicely and there are browned bits forming at the bottom of the pan. This will take about 5-7 minutes. Stir every now and then so they don’t burn. Add the vinegar and stir, scraping the bottom of the pan to remove the browned pieces and deglaze the pan. After a minute or so, add the spices, beans, rice, and tomatoes along with the protein that you’re using. Stir to mix and saute for about 3-5 minutes until the tomatoes soften and the rice and beans are warm. Remove from heat and salt and pepper, to taste. Remove the bay leaves before serving if desired. Makes 4 servings at approximately 132 calories – 5g protein, 28g carbs, and 0g fat (not including protein). We used sliced vegan chorizo in our version and it turned out great. You can also serve it over more rice if you want to make it a larger dish, but the portions are pretty large. When you see recipes, think beyond what’s listed in the ingredients and see if you have something similar on hand to use instead. You’ll save money and you’ll end up making your very own variation. Bam!